Flowers of Marin is going camping–we’ll be back with more blog posts for you next week. Meanwhile here are some photos of the gorgeous Monvero Dunes and the surrounding area for your enjoyment. The Monvero Dunes are a rare inland dune system, perched atop the hills of the western San Joaquin valley. The floral assemblage there (and in much of the San Joaquin) has more in common with the Mojave than with the Bay Area. This land is owned by the Bureau of Land Management, but because it is surrounded by private property it isn’t generally open to the public. I was lucky enough to visit it on a field trip the BLM hosted because it was a great wildflower year for the dunes (though not a great wildflower year in general). Enjoy! Hazlenut is in bloom with subtle yet stunning flowers right now. It’s worth a pause next time you pass one of these leggy, twiggy little shrubs. 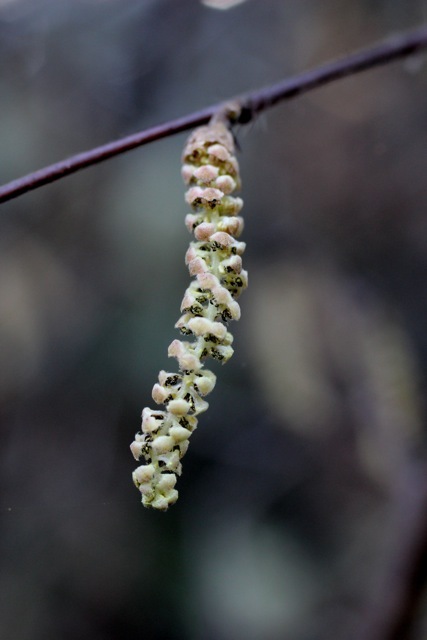 Right now the leaves are just beginning to bud out, but the branches seem mostly naked but for long dangling caterpillars of the male catkins. But hiding, almost invisible from a distance, are the tiny red female flowers. 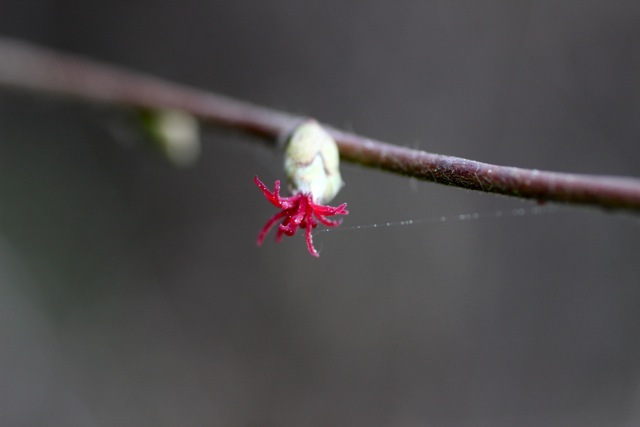 This minute explosion of showy red stigmas emerges from a simple-looking bud; the whole thing is less than a centimeter long. But I think they are a special & lovely sight to behold. Check out my full post on hazlenut (Corylus cornuta) here. A dainty spray of picture-perfect white flowers grows on a shady slope. Five smooth white petals surround ten rust-tipped stamens. This is California saxifrage, or Micranthes californica. This saxifrage is mostly a Californian species–it’s range extends from southern Oregon to Baja. The pretty blooms grow on a long reddish stalk that rises from a handful of hairy, tongue-shaped leaves growing close to the ground. The flowers often are on only one side of the stalk. 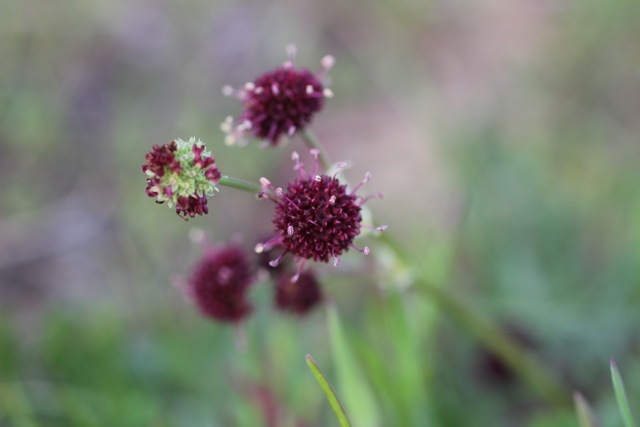 Dark burgandy balls of flowers hover above the trail like tiny, wine soaked pom-poms. A few long yellow-tipped stamens are excerted from the purple ball. 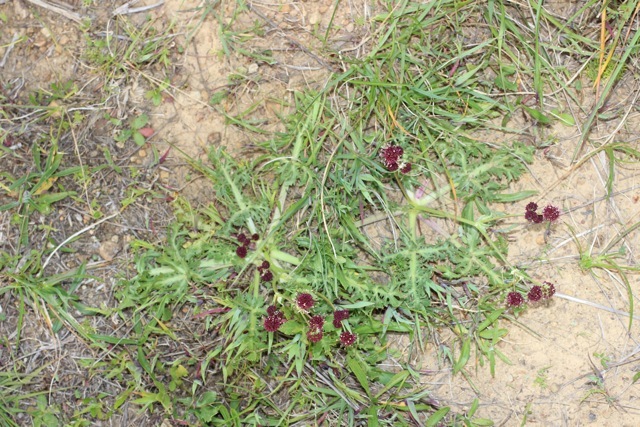 This is purple sanicle, or Sanicula bipinnatifida. It’s unobtrusive but nifty. A large yellow flower blooms on a grassy hillside. The single flower head atop a strong, sturdy stalk looks rather like a small sunflower, with deep yellow ray petals. Leaves are mostly basal, and can be long and skinny or spade-shaped. Both leaves and stalks are slightly hairy and the inflorescence is flanked by many small, hairy bracts. This is narrowleaf mule ears (Wyethia angustifola) which are somewhat more common than their shorter cousin, Coast Range mule ears. W. angustifolia grow to between 1 and 3 feet tall. It also lacks large, leaf-like bracts surrounding the yellow flower. The stems and seeds of the plant are edible; they were eaten raw, and the seeds were pounded into a sweetened flour called pinole. The leaves and roots were used medicinally; roots were pounded into a poultice used to draw out blisters or treat lung ailments. A bath made from leaves was used to treat fever. Narrowleaf mule ears is also known as California compassplant. With flowers like tiny art-deco rocket ships, foothill shooting star (Dodecatheon hendersonii) is one of the most beautiful spring blossoms. Backward flung petals start out charcoal, then burn into a thin band of flame-yellow before flaring into pale purple. At the front of the flower, dark and pointed anthers hug a narrow pistil, so the whole group terminates in a single point. These perennial little plants grow along the Pacific Coast from BC to California. 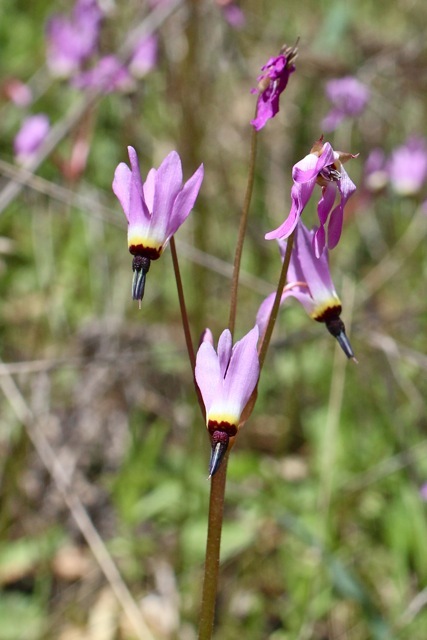 There are many species of shooting star, but only two that are in the SF Bay Area. You can tell foothill shooting star from Padre’s shooting star because its anthers are pointed, not rounded, and lack a yellow spot at their base. Foothill shooting star is also called mosquito bills–a more evocative name. Chocolate-colored, bell-shaped flowers nod in a meadow full of bunchgrass. Each stem has many six-petaled blooms scattered along its stalk. 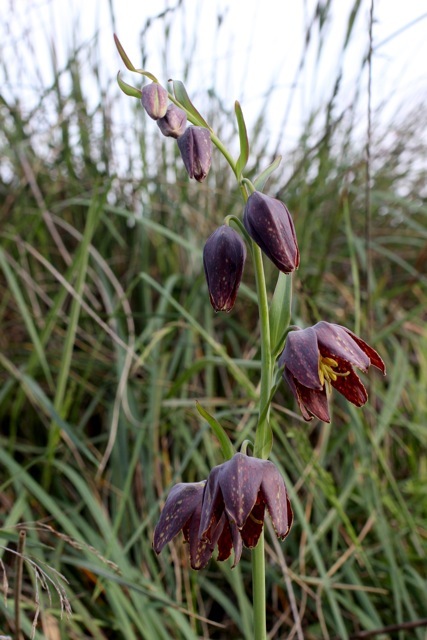 This is checker lily (Fritillaria affinis), a beautiful native of the west coast. It can be found in forest, brush and grassland. Checker bloom has purple-brown petals that are mottled with green, and appear slightly frosted or glaucous on the outside. The flower forms a cup around six yellow stamens, and a three-parted pistil whose stigmas are tipped with tiny hairs. There is a rare variety, F. affinis ssp. tristulis, which is only found in Marin and is a special status species. It has less mottling and larger petals ( 2.7 to 4 cm long instead of 1.2 to 2.3 cm long). 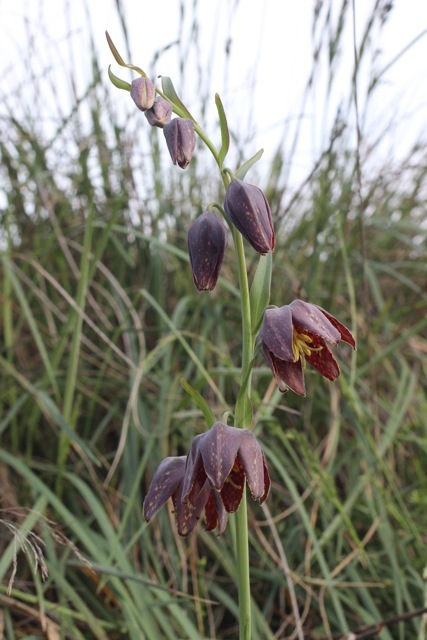 Indigenous tribes ate the stems and bulbs of checker lily: roasted, dried, and as flavoring. Often they were boiled or steamed in pits. They are slightly bitter, even when cooked, and often were soaked overnight before cooking to make them more palatable. 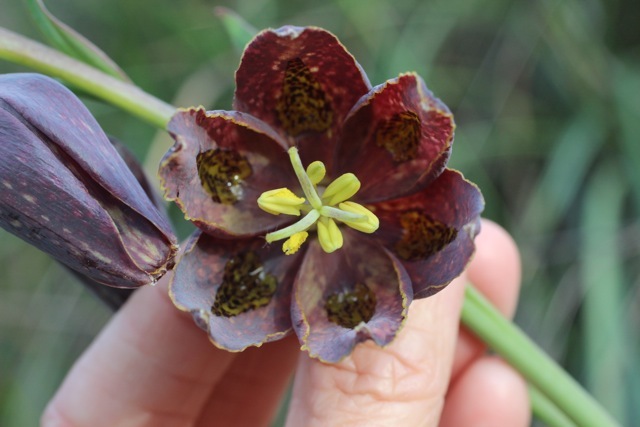 Other names for this species include mission bells, chocolate lily, and riceroot (after its bulblets, that look like grains of rice). 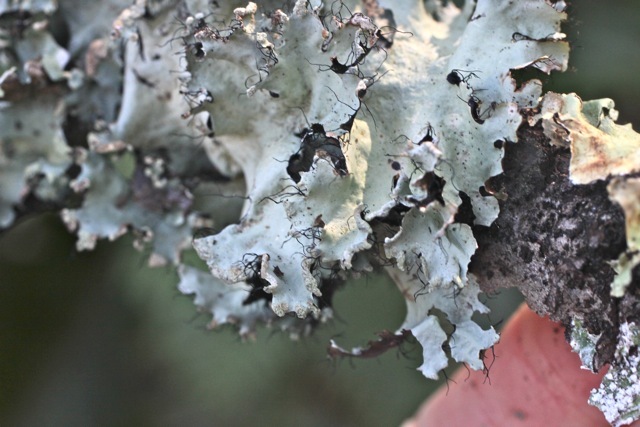 Here is another cool lichen genus! 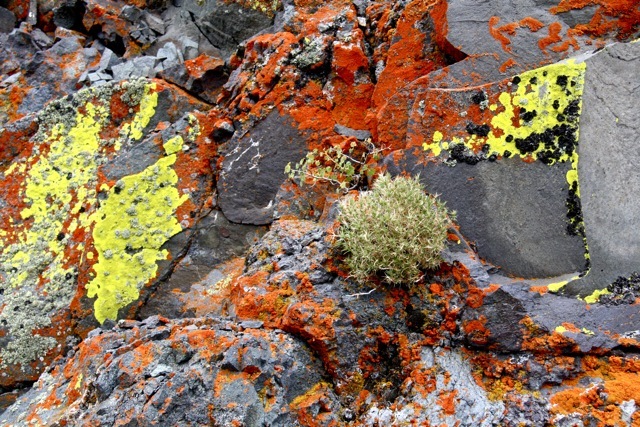 The Caloplaca are orange crustose lichens that forms nubbly patches on exposed rocks. 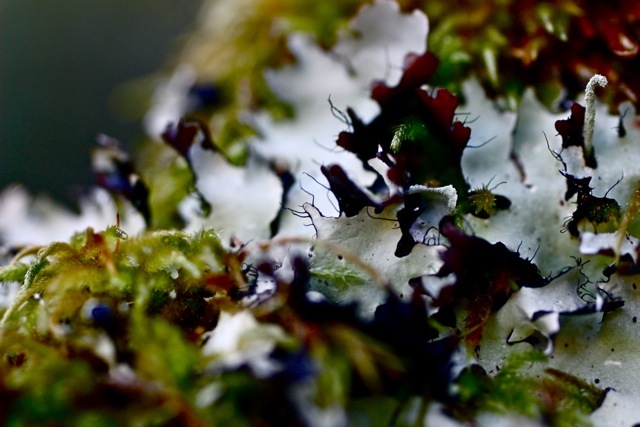 They are nitrogen-loving little organisms, so when you spot some you have a good hint that there is high nitrogen present (or so I learned on a hike last month with lichen expert Shelley Bensen). You might see it on rocks where birds like to perch and deposit their nitrogen-rich droppings. Caloplaca also is abundant along roadsides with heavy traffic, where car exhaust spews out nitrogen oxide as well as other pollutants. 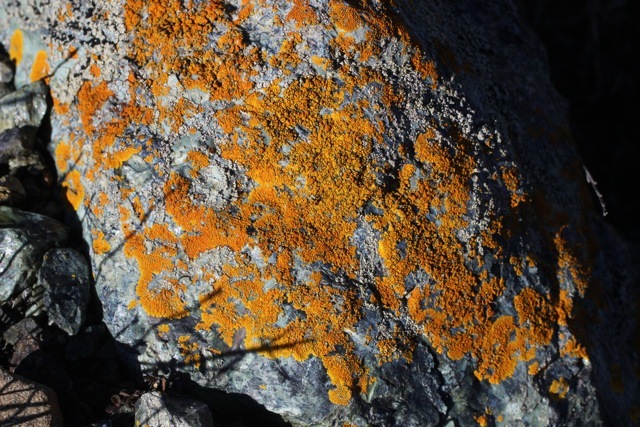 Caloplaca is a crustose lichen; if you see a bright orange foliose lichen, then you’re probably looking at Xantharia. Look close, because the “leaves” of Xantharia might be very small; and they might look nubbly also, due to the presence of raised little fruiting bodies. Dead tree branches often bring lichens with them when they fall to the ground; sometimes a single branch will have many different types of lichen all growing close together. One of my favorites looks like papery lettuce-shaped leaves that are pale aqua-gray on top, and dark beneath. A fringe of eyelash-like hairs decorate the edges of the leaves. This is a genus known as parmotrema; there are well over two dozen species of it in the US, according to the USDA PLANTS database. Another manzanita to follow on the heels of yesterday’s. Glossyleaf manzanita (Arctostaphylos sensitiva, formerly known as A. nummularia) is a beautiful plant. Small, glossy leaves grow densely along slim branches that are often conspicuously covered in long pale hair. This is the only manzanita in the area to have only 4 petals, and the white lantern-shaped flowers have a paler patch at their base, so the flesh of the petal seems nearly translucent where it joins the stem. Glossyleaf manzanita is also called shatterberry, because its fruits break into pieces while still on the plant. According to the Marin flora, the long berries look so unlike other (round) manzanita fruits that it was initially thought to be in a different genus entirely.